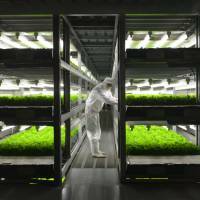 Are indoor farms the next step in the evolution of agriculture? You’ve probably heard of farm-to-table, or even farm-to-fork, agricultural movements that emphasize the connection between producers and consumers. But what about factory farm-to-table? Spread, a giant factory farm that grows lettuce in Kameoka, Kyoto Prefecture, is just one of more than 200 “plant factories” in Japan capable of harvesting 20,000 heads of lettuce every day. Their lettuce, which includes frilly and pleated varieties, is grown in a totally sterile environment: There’s no soil or sunlight, no wind nor rain. The rich, dark-brown soil in which produce has traditionally been grown is utterly alien inside the factory. Instead, the lettuce is grown hydroponically, in a nutrient-rich gelatinous substance. The vegetables grow in vertically stacked trays under LED lights timed to come on during the day and switch off at night. 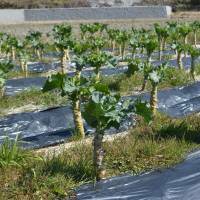 The lettuce Spread grows in Kameoka — which takes about 40 days from planting to harvest — is packed into bags and shipped to over 2,000 supermarkets across the country. The product also makes it into airline meals, although the company wouldn’t reveal which ones. At a time when Asian countries are scrambling to deal with the surges and declines in population as well as the effects of climate change, factory farming is a burgeoning business. In Japan, for example, the number of farmers has dropped from a high of over 7 million in the 1970s to under 2 million, and today the average age of Japanese farmers is 67. Spread, however, is about as far from the pastoral image of a vegetable farm you can imagine. 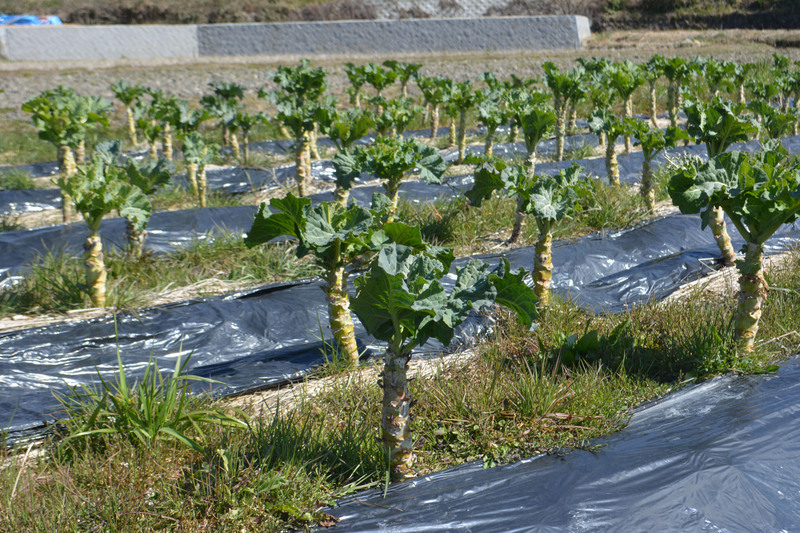 While the facility, and even the concept, sounds futuristic, Spread has been growing lettuce in these conditions since 2006 at its Kameoka base. This year, it will open another plant factory at Kansai Science City, on the borders of Kyoto, Nara and Osaka prefectures. Between the two factories the company will be able to produce 50,000 heads of lettuce each day. What makes the new facility different is the level of automation: tasks such as raising seedlings, replanting and harvesting will be done by machines and guided by artificial intelligence, a move that will cut labor costs by 50 percent and boost profitability. In 2016, Spread was awarded a gold medal at the Edison Awards in recognition of its role in agricultural innovation. On a recent tour of Spread’s facility in Kameoka participants viewed the lettuce through an observation window, while factory manager Naohiro Oiwa communicated via telephone with a worker dressed head to toe in white protective clothing. “When our products first appeared in supermarkets, plant factory-grown vegetables weren’t yet recognized by many people. Our sales staff had a very hard time selling them to retail stores,” Oiwa said. People wanted to know if vegetables grown without sunlight are safe to eat, he added. Spread has since assuaged some of those anxieties by emphasizing the safety of its growing environment and the quality of its crops. It also helps that Spread can compete on cost: a bag of its lettuce sells for ¥198, a price the firm can maintain. Field-grown lettuce, by contrast, is subject to the vagaries of the weather, and therefore to fluctuations in price. So-called vertical farms, such as Spread’s facility in Kameoka, are also able to use water in an extremely efficient way. The company would not disclose, however, how much it spends on something that is essentially free to conventional farmers, sunlight, or, in Spread’s case, LED lighting. Spread spokeswoman Minako Ando said that the firm’s operations received a boost in the aftermath of the nuclear disaster in Fukushima Prefecture following the Great East Japan Earthquake, which struck six years ago today. Amid widespread fears that traditionally grown produce could contain radioactive fallout, factory farming, which is mostly done indoors, suddenly looked like a safer option. It’s important to remember that, while Spread is at the vanguard of technological developments in farming, the history of agriculture has always been characterized by innovation in its tools. Spread doesn’t see its role as replacing farmers; it seeks to complement and support the agricultural industry as a whole, Oiwa said. Along the way to profitability — Spread started operating in the black in 2013 — it has developed several patents and is now in talks with partners around the world to set up similar ventures. 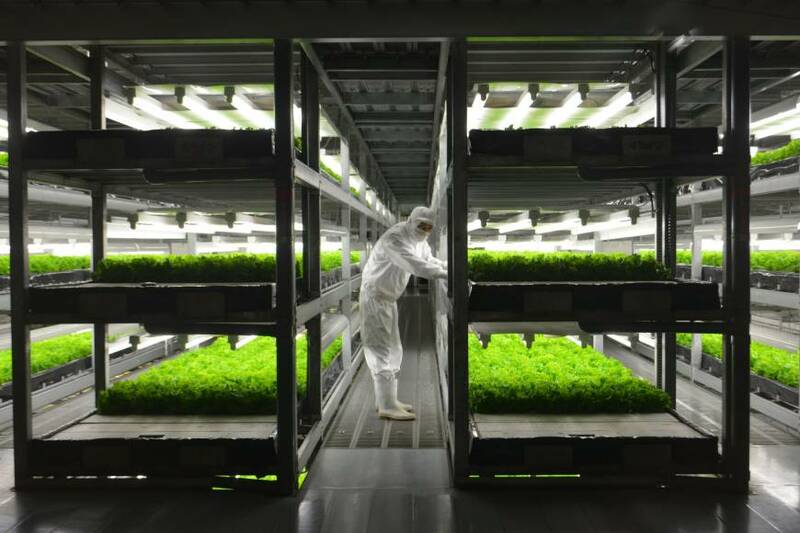 With the know-how it has gathered from growing lettuce, Oiwa said, Spread could start mass-producing other vegetables, such as tomatoes, in giant plant factories in the years to come. Michael Blodgett, an organic kale farmer in Wazuka, a picturesque tea-producing town in southern Kyoto Prefecture, echoes the notion that, when it comes to farming, innovation is nothing new. “From that viewpoint, new and sustainable techniques for growing healthy vegetables are certainly welcome,” Blodgett said. He noted, however, that the type of farming he and his neighbors practice engenders a sense of community. Advice is solicited from older farmers, and at harvest time neighbors share what they bring in from the fields. “There is something special about planting seeds in the ground, taking care of the plants by weeding, watering, and love,” Blodgett added. In the near future it will increasingly be the charge of robots and AI systems to plant, weed, water and harvest the food that ends up on our table. Where exactly that leaves the farmers, or the land itself, remains to be seen.